As you may well know, there was no Michigan Makers last Tuesday, because Mitchell school was on spring break. Next Tuesday is the last session of Michigan Makers for the year! Next Tuesday, April 15th, parents are welcome to come by for the Michigan Makers makerfest. Students will have things that they are proud of making on display. 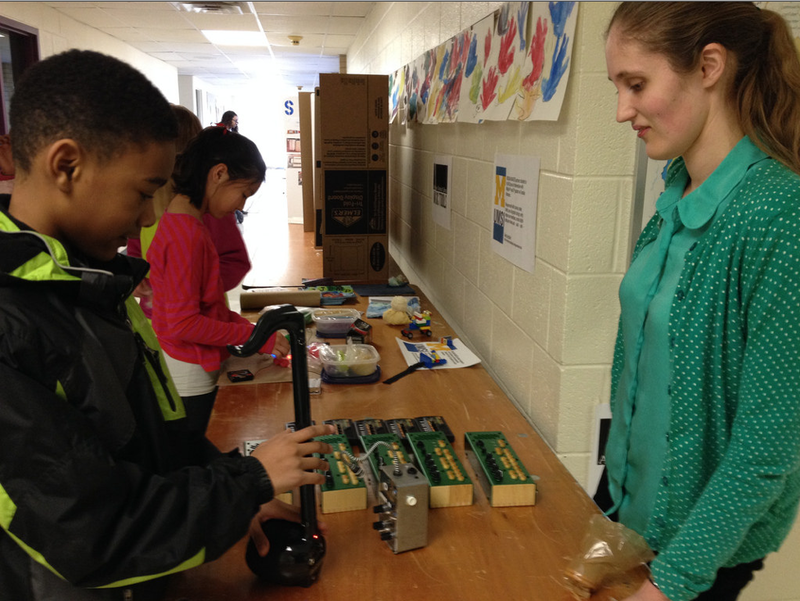 Michigan Makers got to participate in the Mitchell School science fair! This week was our first class after University of Michigan's winter break. It was a little tough for everyone to stay focused, and two adults were absent due to illness. Because we didn't get to go to Mitchell last week, we gave all of the students bags of materials to make things for this class. Most students made all kinds of cool things, but forgot to bring them in today (but said they'd bring them next week). Some students forgot to make things, but said they will when they get a chance. The students that did bring in their creations got to show them during our closing meeting. Here Miles is showing his six-wheeled car that transforms into a flying contraption. He also made a penguin. You might notice that many students are wearing necklaces here. That's because Kristin, the woman in charge of Michigan Makers went to Hawaii and brought back Kukui nut necklaces. Before electricity, Hawaiians would burn the nuts for light. These days, the Kukui nut is a sign of knowledge. We had some guests today, and so students could wear Kukui necklaces to show that they were okay with being asked questions. The guests from Hillel Day School enjoyed seeing how students explore and work in Michigan Makers. The activities for today were stop-motion animation, making things with materials from the scrapbox, snap circuits, name stickers, choose your own adventure story-writing (or just creative writing), using the sewing machine to make a pull-tie bag, being the reporter, and building with Legos. This week our menu included sewing, marble-run-making, choose-your-own-adventure-story writing, bean bag making, and virtual Legos. Virtual Legos? What?! It's true, right here with Build with Chrome. Unfortunately, we had some difficulties using Build with Chrome on the school laptops. Apparently a certain plug-in for Google Chrome kept crashing, but hopefully, we'll find a way to fix that. 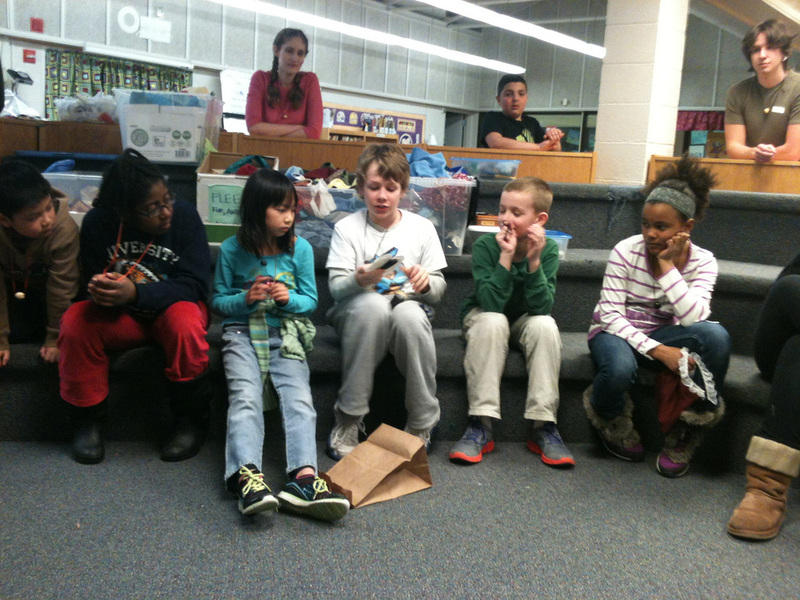 For the bean bags, very patient students took turns learning how to use the sewing machine to make a pocket. They then turned it inside out so that the seam was on the inside, filled the pocket with dried beans, and sewed the top closed. We need to learn not to throw the bean bags at each other, however. We don't want anyone to get hurt. Some students took matters into their own hands and independently made things, which is, of course, fantastic! Here is an example: a stop-motion animation that Vickie made. The 3D printer that we were all excited to use last class unfortunately was not working for this class. We'll try to have it fixed before next time. This week, our menu included making marble runs, using Pixlr (an online tool for photo editing), sewing, and writing a choose-your-own-adventure story. Perhaps the most exciting event that happened, though, was the arrival of the 3D printer! 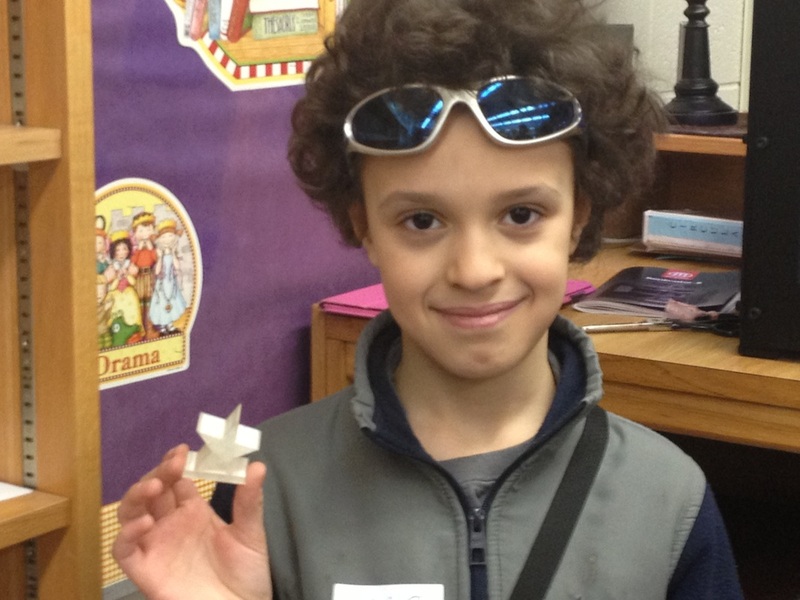 To print something on the 3D printer, a student needs to design it in 3D modeling software like SketchUp or Tinkercad. 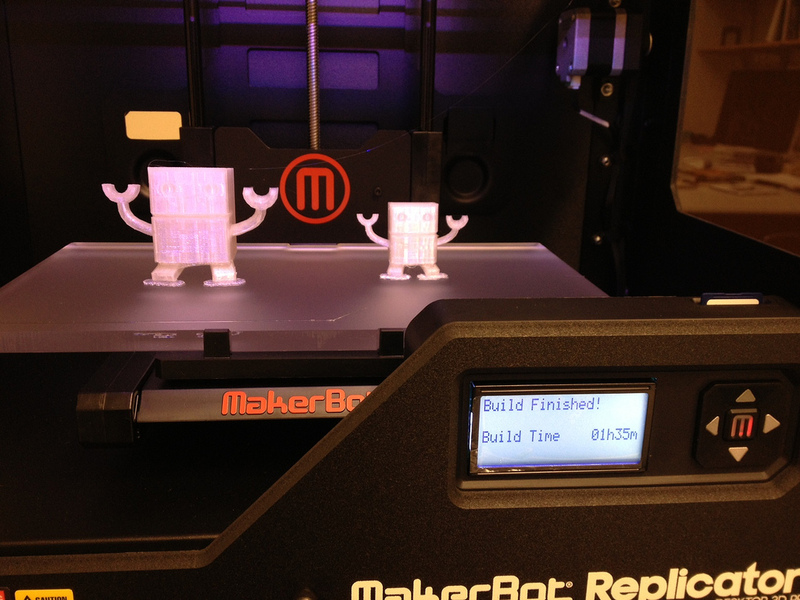 Files that are ready to print can also be downloaded from Thingiverse, like the robots above. 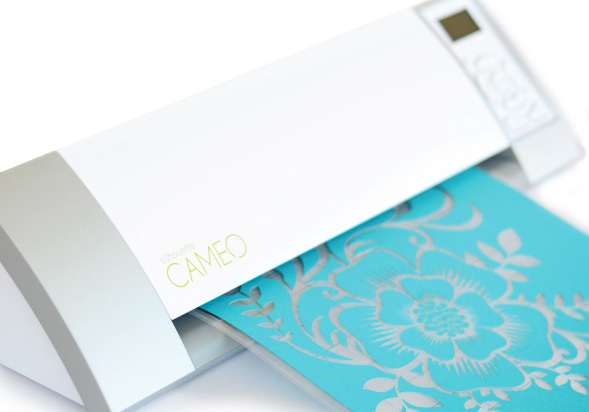 When the file is ready, we connect the printer to a computer and run makerware, which allows us to tell the printer what size, where, and in what direction the thing will print. We've had a couple classes with 3D modeling so far, but SketchUp has been frustrating for quite a few students. Now that we understand how we can use SketchUp for printing objects, it might be easier to understand. Kevin worked with SketchUp last week to 3D model the logo for his basketball club. This week he got to print it! So that everyone could get a chance to 3D print something, each student got to choose to print either a wrench charm or a pair of scissors charm. We were fascinated watching the printer and very excited about what we can make in future classes. Even teachers and parents came in to watch and get excited. We also learned that the 3D printer takes a long time to make things, and only half of the class got to print their charms. Next week we'll finish printing those and start learning how to make new designs. WEEK 3: Farewell, squishy circuits! We had a busy week. We said goodbye to Squishy Circuits (but take a look at what happened when someone found a motor in the SC bag), added hand-sewing upcycled scarves, and kept going with origami and Snap Circuits. We also recorded our maker theme song so Theo can use it as he prepares a project on how to make our own speakers. We weren't quite as good at things like cleaning up (wow! What a mess the Snap Circuits were!) or listening respectfully during our closing meeting, both of which are important maker skills, so we'll keep working on those! We have had three weeks' worth of Squishy Circuits on our menu. Before we take retire it from active service, enjoy this video of a master sculptor at work. He's creating a portrait of Squishy Circuits co-founder AnnMarie Thomas. Enjoy!